Democratic female members of Congress cheer after President Donald Trump said there are more women in Congress than ever before during his second State of the Union address to a joint session of Congress at the U.S. Capitol in Washington, Feb. 5, 2019. He didn't count on the women in white. President Donald Trump's State of the Union speech on Tuesday was billed as his attempt to unify the country. 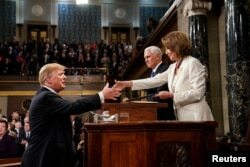 President Donald Trump, before delivering the State of the Union address, shakes the hand of Speaker of the House Nancy Pelosi at the Capitol in Washington, Feb. 5, 2019. 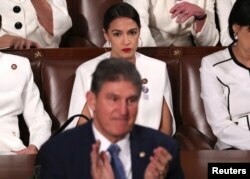 Rep. Alexandria Ocasio-Cortez (D-NY) (R) remains in her seat as Senator Joe Manchin (D-WV) stands and applauds as President Donald Trump delivers his State of the Union address to a joint session of Congress at the U.S. Capitol in Washington, Feb. 5, 2019.